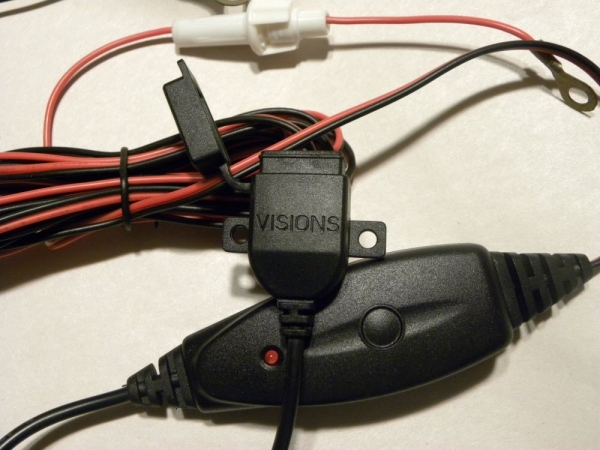 Visions Weatherproof Hardwired USB Power Port / charger with moutning tabs. New WeatherProof Hardwire USB Power Port / Ipad, Galaxy Tablet Compatible Charger 2Amp. Our new weather resistant hardwired USB charger (10 watts) With mounting tabs is the most powerful weatherproof USB charger on the market. It is a convenient way to have a USB power port on any Vehicle . 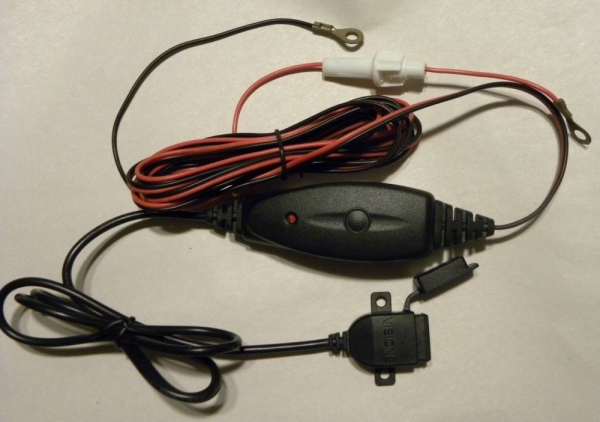 This USB Power port is a convenient way to have a USB power port on your Motorcycle or any other Vehicle where the use of a regular car USB adapter would not be practical. Hardwire your GPS , tablets or phones has never been so simple. Simple Do it Yourself installation. Only 2 wires to attach to 12vdc source. Red wire to the plus (+) and the black wire to the Minus (-) side. Note, the USB power adapter is rated for 5vdc 2amp max. With a length over 2 meters, no need to splice additional wire. 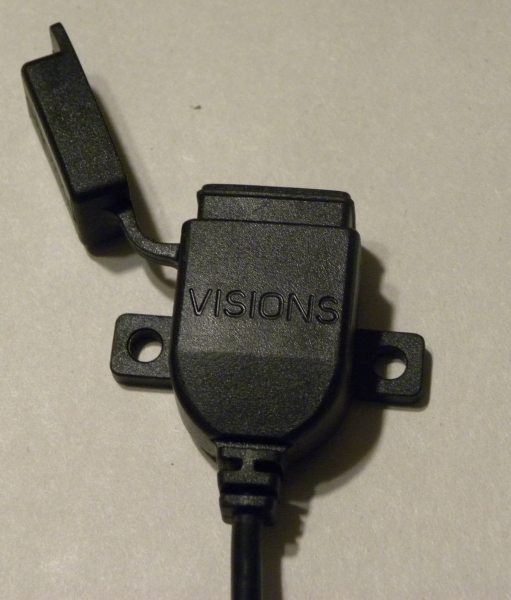 Note for Tablets Required special Visions cables sold seperatly. Never attempt to connect or disconnect any devices from the USB power port while the vehicle is motion. All our products come with an unconditional Money Back Guarantee. See our return policy for more details. This weather Resistant Hardwired motorcycle power outlet (5vdc 1 amp) is a convenient way to have a USB power port on your Motorcycle or other Vehicle where the use of a regular car USB adapter would not be practical. This Iphone compatible, compact USB Car Adapter is perfect for you or the road warriors in your life. With 2 adapter ports and 1 USB charging port it will have you covered. Plug up to 3 devices at once. This portable Car Adapter is perfect for you or the road warriors in your life. With 3 adapter ports and 1 USB charging port it will have you covered. Plug up to 4 devices at once. Unique USB Flash Drive in the shape of a key. This is a clever way to make sure you always have your Flash Drive handy when you need it. We have many different styles and capacity to choose from. Unique USB Flash Drive in the shape of a heart pendant. We have many different styles and capacity to choose from. Unique USB Flash Drive with an intricate carving of a dragon on the case. We have many other different styles and different capacity to choose from.